The Working Proof have a print of mine featured in their shop this week. 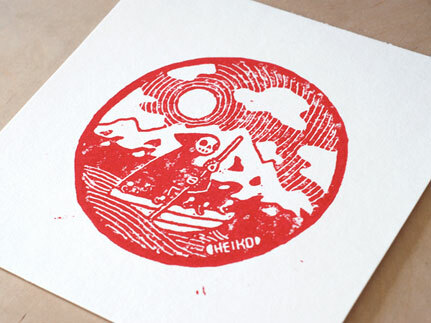 The print is a hand pulled linocut, in an edition of 50 on 300 gsm Hahnemühle watercolour paper. Check it out here! The Working Proof seeks to promote art and social responsibility. Each print is paired with a charity of the artist’s choice, to which we are donating 15% of the sale of each print – creating what we believe to be a product with not just aesthetic, but social value. Besides showcasing emerging artists and great artwork, the intent of the Working Proof is to promote a variety of charities and to expose them to new supporters through the appreciation of art and creativity. We release a new print once a week, on Tuesdays at 1:30 pm, EST. This one was Lil’s idea, but she thought that I might execute it better. Hope I did. The most exciting jobs I had to date were product design jobs, e.g. the snow boards, the vodka flasks. I would love to get more! In the meantime, I’ll just make up my own.